Dr. Vimal Nanavati is an Interventional Invasive Cardiologist residing in San Diego, California. He was recruited to Northern California from Ohio in 1997 to initiate a quality Cardiology Program for the people living on the Northern Coast of California. Dr. Nanavati inaugurated the Arcata Heart Care Program and was the director of their first Cardiac Catheterization Lab at Mad River Hospital from June of 1998 to March 1999. In 1999, Dr Nanavati relocated to Redding in order to provide his patients with more comprehensive cardiology services. Since 2005, Dr. Nanavati has been in San Diego providing Cardiology Services. Dr. Nanavati performs cardiac catheterizations, angioplasty, coronary Stent deployment, intracoronary ultrasound, and Doppler Pressure measurements in the coronary artery. He also provides the complete array of non-invasive diagnostic tests such as echocardiography, stress testing, pacemaker follow-up, and EKG testing. Since March 2002, Dr. Nanavati has added EECP (Enhanced External Counterpulsation), the only noninvasive therapy for angina not amenable to intervention or bypass surgery. Dr. Nanavati received his medical training in Chicago, Illinois, where he grew up. After finishing his fellowship training at the University of Illinois in 1993, he traveled to Ohio where he was in practice until 1997. 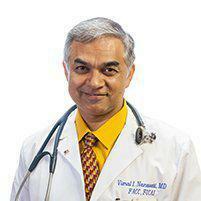 Dr. Nanavati is Board Certified in Cardiovascular Diseases and Internal Medicine. He is a member of American College of Cardiology, Society of Angiography, and Interventions, American College of Physicians, California Medical Association, and San Diego County Medical Society. "Treat every patient as if they were your own family member." "If I cannot provide the most advanced therapy, I will find someone eminently qualified who will." "The smile on a patient's face is my greatest reward." "If you don't need the procedure, I'm not going to order it." "The best patient is the informed patient." Dr. Nanavati feels it a singular honor and privilege to serve the heart care needs of all patients and family members who use this site. This website is dedicated to them. 655 Euclid Ave, Ste 301, National City, CA 91950 in National City. This was a study designed to test the ability of a certain drug belonging to a new class of drugs called PSK9 inhibitors to reduce LDL cholesterol. If you are experiencing these symptoms, dial 911 immediately! Every year, tens of thousands of Americans survive heart attack, go back to work and enjoy a normal life. You have every reason to be confident of a full recovery. Your heart is healing and with each passing day you’ll get stronger and more active. If you do not currently have medical insurance, no problem. If you have a diagnosis of heart disease or you think you may have heart disease, feel free to set up an introductory meeting. We have several heart care packages that allow you to receive continued Heart care with our Board Certified Cardiologist. After an initial evaluation, we can determine which package works best for your specific needs. Call us now. Don't wait for a heart attack! Words cannot express our gratitude to you for your kindness to Charlie, you were always there when he needed help, for that we will always be grateful. I have never met a doctor who takes the time to help his patient and their family like you have done to us. And for that I’m very grateful. God bless you and your family! I’m so grateful for your care of me during my most difficult time. Again, Dr Nanavati Thank you so much. Most of all I am forever grateful to you for your wisdom, skill and compassion. You will always be my hero! I am the baker from the Seattle area whose life you saved on November 26th right after Thanksgiving. Thanks to you I am well on the road to recovery. Thank you, for giving Roy T. the best medical attention that anyone could ask for . Most of all forgiving us more time to spend with him. Dayton and I would like to express our sincere thanks and appreciation for the spiritual as well as physical healing you were so thoughtful to extend. Thank you very much for being there to save Mora’s life. We appreciate you. God Bless you and your family.